Growing literature suggests that civil resistance is a strategically superior means of waging a struggle, but why do some movements continue to respond to violent repression with violence? Based on extensive, comparative fieldwork, this chapter sheds light on why some groups transform their tactical responses to police provocation, from riots and arson to disciplined, strictly nonviolent methods of struggle. 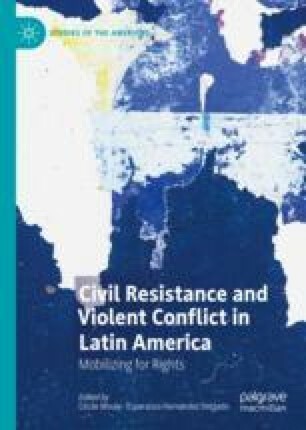 Ethnographic evidence from two cases of mining conflicts in Peru illustrates how, within a context of legal and discursive criminalization, civil resistance movements learn how their opponents use discourses of “violence” and “terrorism” to delegitimize, repress, and demobilize their struggle. Activists directly cite this mechanism as a key reason why they adopt strictly nonviolent tactics and frames, train their activists in the importance of these methods, and discipline their actions. This research thus contributes an in-depth look at how conflict dynamics, criminalization, and movements’ learning processes affect their tactical and strategic choices. This research was supported by generous financial assistance and intellectual mentoring from the US Institute of Peace, the International Center on Nonviolent Conflict, the Chicanx/Latinx Research Center at the University of California, Santa Cruz (UCSC) and the UCSC Department of Politics. CNDH (Coordinadora Nacional de Derechos Humanos). 2014. CIDH expresa su preocupación por criminalización de la protesta social. Lima, November 10. http://derechoshumanos.pe/2014/11/cidh-expresa-su-preocupacion-por-criminalizacion-de-la-protesta-social/ (accessed November 21, 2016). ———. 2015. Grave denuncia sobre la actuación de la DINOES en el Valle del Campo. Lima, April 24. http://derechoshumanos.pe/2015/04/grave-denuncia-sobre-la-actuacion-de-la-dinoes-en-el-valle-del-tambo/ (accessed May 15, 2017). CVR (Comisión de la Verdad y Reconciliación). 2003. Informe final [final report]. http://cverdad.org.pe/ifinal/ (accessed November 12, 2016). EJA (Environmental Justice Atlas). 2014. Ronderos de Pulán contra minera La Zanja, Perú. Environmental Justice Organizations, Liabilities and Trade. http://ejatlas.org/conflict/ronderos-de-pulan-contra-minera-la-zanja-peru (accessed April 2, 2015). El Búho. 2015. Video: Habla Antonio Coasaca, Agricultor que Fue ‘Sembrado’ por la Policía. April 28. http://elbuho.pe/2015/04/28/reunion-entre-representantes-de-los-derechos-humanos-y-el-agricultor-antonio-coasaca-fue-suspendida/ (accessed May 15, 2017). Gurmendi, Alfredo. 2011. The Mineral Industry of Peru. Minerals Yearbook. United States Geological Survey. http://minerals.usgs.gov/minerals/pubs/country/2011/myb3-2011-pe.pdf (accessed May 14, 2015). OEC (Observatory of Economic Complexity). 2017. Peru. Massachusetts Institute of Technology. http://atlas.media.mit.edu/en/profile/country/per/ (accessed July 25, 2017). Triscritti, Fiorella. 2012. The Criminalization of Anti-Mining Social Protest in Peru. State of the Planet: Blogs from the Earth Institute. September 10. http://blogs.ei.columbia.edu/2012/09/10/peru-mining/ (accessed April 20, 2015).